New data released by the New York Federal Reserve Bank shows that the nation's capital leads the country in student debt concentration. 25.9 percent of District of Columbia residents carry at least some student debt. 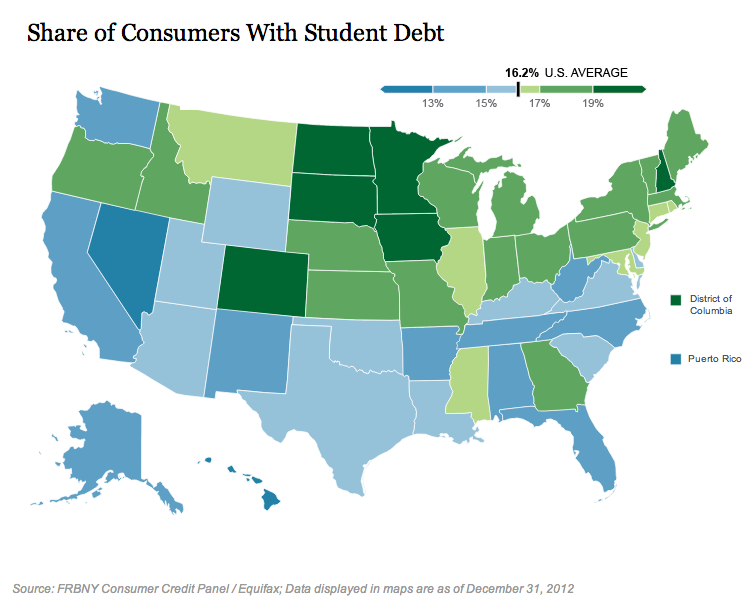 Following D.C. in concentration of student debt is Minnesota with 22.3 percent. Hawaii has the lowest concentration of student indebtedness -- just 11.5 percent. The national average is 16.2 percent of a state's residents with some student loan debt. D.C. also has the highest average amount of debt per borrower. The average student loan borrower in D.C. owes a somewhat astonishing $41,230, compared with a nationwide average of $24,810. Maryland has the second highest-amount per borrower -- $28,330. Virginians with student loans owe, on average, $26,310. 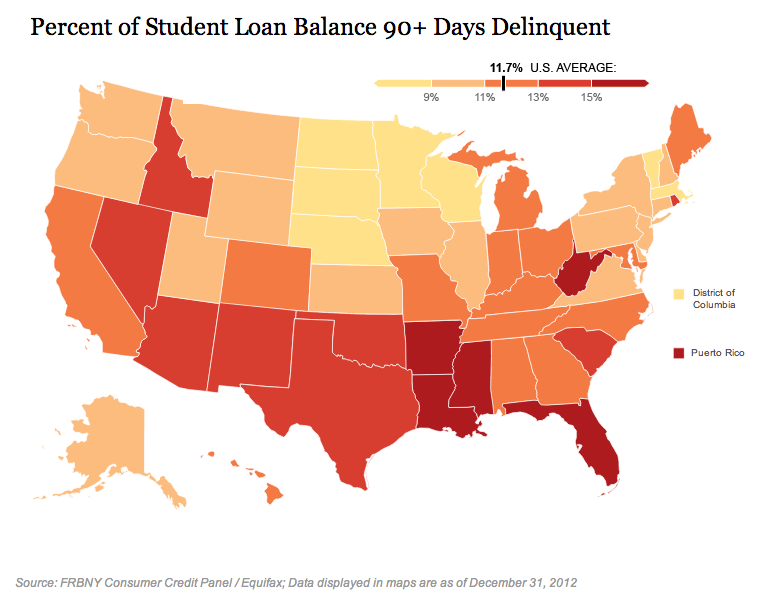 On a positive note, D.C. has the country's second-lowest student loan delinquency rates -- 7.3 percent. South Dakota is number one -- that is, it has the country's lowest delinquency rate -- at just 6.6 percent. West Virginia has the highest delinquency rate with 17.8 percent. The national average is 11.7 percent. WAMU examined the findings and came to some interesting conclusions. First off, the D.C. Metro region has the highest proportion of graduate degrees in the country, according to the U.S. Census. Fully 22.9 percent of local residents have gained a graduate or professional degree, likely adding debt in the process. But as they add debt, they also increase their job prospects—especially in the D.C. region, which weathered the recession better than many parts of the country and remains a magnet for young professionals. More importantly, though, is the fact that while D.C. students might be weighed down in debt, they're managing it pretty well. According to the Federal Reserve, the percent of student loan debt that is delinquent by more than 90 days stands at 7.3 for D.C., lowest in the country. In Virginia, it's 9.6 percent, below the national average of 11.7 percent; Maryland, for its part, stands at 12.1 percent. West Virginians fare worst, with 17.8 percent of students 90 days delinquent. And hey kids -- don't forget: D.C. is one of the best places for young adults in the U.S.!